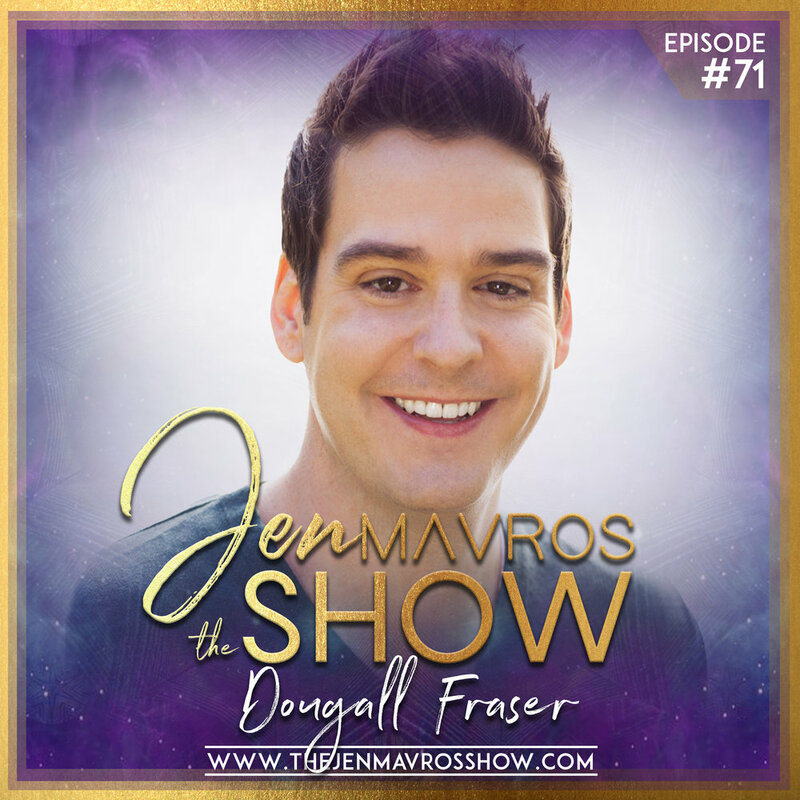 In Episode #71 on The Jen Mavros Show, we pull up a chair with Internationally renowned psychic and cosmic life coach, Dougall Fraser. What if you could see colors emanating from people’s souls? My next guest does!! And he draws from years of experience and observation to create a guide for utilizing the innate strength of colors in conjunction with your individual self. From white to gold to emerald green, every color has qualities that you can consciously draw strength and purpose from in order to support you in achieving your highest goals and dreams. Fraser explores each key color’s unique spiritual and practical qualities, providing insight into its history and shadow sides, real-world personal and professional anecdotes, and exercises and inspiration to evoke each color’s maximum power. His step-by-step plan will help you to integrate color energy into your daily life, from the inside out. Unlock the full magnitude of your soul’s potential by letting its true colors shine bold and bright! interpreting the colors he sees around you. Recognized at the age of twenty as "Best Psychic In Dallas" by the Dallas Observer, Dougall has since been featured in a variety of international media outlets. With over 20 years of professional experience in seeing auras, Dougall demonstrates how color can be used to easily change and improve specific aspects of our life. He discovered that not only does each color possess consistent qualities, but their energy can also be used to easily change and improve specific aspects of your life. From white to gold to emerald green, every color has qualities that you can consciously draw strength and purpose from, in order to support and guide you toward achieving your highest goals and dreams. Dougall teaches a variety of online programs designed to help optimize your energy in practical ways. He provides intuitive sessions as well as his own brand of life coaching known as Cosmic Coaching. Dougall utilizes color therapy, clairvoyance, intuition, empathy, interior design, and practical advice in his approach. Dougall is a seasoned public speaker who inspires audiences with his down to earth approach to spirituality and relateable sense of humor. In 2016, he presented at Pearl xChange alongside Marianne Williamson, Nicole Richie, and Gwyneth Paltrow. Dougall was an invited speaker at OWN University, a live event series hosted by the Oprah Winfrey Network, and is a featured blogger for the Huffington Post. He has been featured on national television shows such as Dr. Phil, The Doctors, Dancing with the Stars, and the Real Housewives of O.C. Dougall’s second book, Your Life In Color, is a guide to help you harness the power of color. It was released in April 2017 through Hay House, the largest new age and self-help publisher in the world.